Located in the West Loop, the Chicago Journeyman Plumbers Union Hall (Local 130) combines the best of Chicago's Art Deco chic with Blue Collar charm. Free parking is available in adjacent lot (entrances on Washington & Randolph), and the Ashland Station of the CTA Green Line train is only 3 blocks away. No tickets are reserved for media or industry, nor are there any discounts for media or industry. See below for details on the venue entrances for parking, CTA station close by, main hall entrance, and tasty eats. We are very happy to be partnering with Chicago Eco House, a local non-profit organization that has been transforming vacant and abandoned properties on Chicago’s South Side (and now in Detroit too) into inner city gardens and flower farms, as well as function sustainably using rain water and solar power. Eco House helps to educate impoverished youth on running a flower farm business, helping them to learn business skills in building and maintaining the farm operation and it would be able to grow more organically. All net proceeds will go toward CEH, as we believe that what Quilen and his team are doing is good for both our people and our planet. You can donate additional funds yourself by clicking on their logo above. Subject to Change Wine Co. 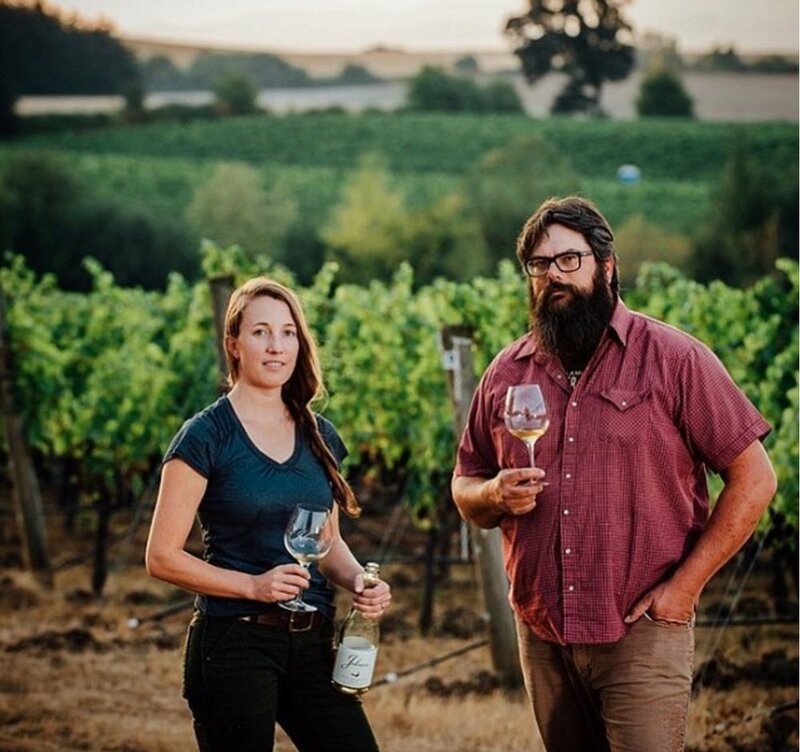 Chef Derek Valentine of TWO restaurant & Winemaker/Owner Derek Einberger of Patton Valley Vineyard in Willamette Valley come together for this month's Wine Education Series dinner. An in-store tasting featuring Vanessa Letort of Les Pirouettes, Maria Koppitsch of Koppitsch & Francesc Escala of Mas del Serral/Can Sumoi. $10/person that may go towards the purchase of any wine that night. Join us after in the bar for special dishes to pair with the featured wines by the glass. Proceeds to benefit Green City Market. Come celebrate a night devoted to natural Greek wines with special glass pours & tastings. Aris Soultanos of Eklektikon will be in the dining room to help teach diners about the Greek winegrowers he represents. You can enjoy a structured tasting of 4 natural Greek wines for an add-on component to regular service of $45, and there will also be six featured Greek wines available by-the-glass in addition to Parachute’s main wine list. 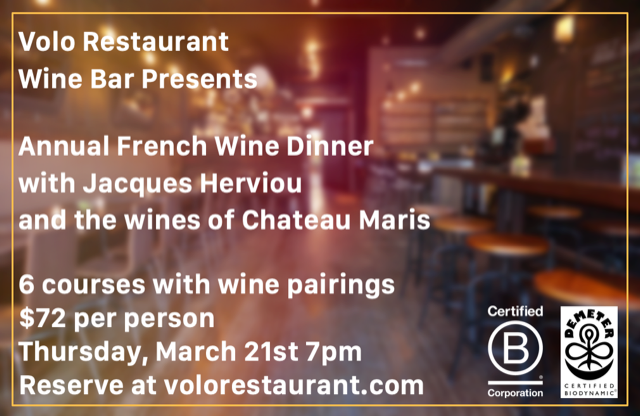 Volo Restaurant Wine Bar is proud to be hosting Jacques Herviou of Chateau Maris for an incredible evening of food, wine, and history. Located in the village of La Liviniere, the first Cru Classe of the Minervois, Chateau Maris built the world’s first organic hemp-straw winery. The building captures and sequesters carbon dioxide in the air, resulting in a carbon negative facility. In addition to becoming a certified B-Corp, Chateau Maris has long embraced the practices of biodynamic farming, receiving Demeter, Eco Cert, and Biodyvin certifications throughout the years. Come meet Jacques and experience the Chateau Maris wines paired expertly with 6 courses of French cuisine from acclaimed Chef Stephen Dunne. Thursday, March 21st, 7pm. $72 per person. Reservations at volorestaurant.com. Romain is crafting incredible wines (mainly Gamay) in this practically unknown area (Côte Roannaise) that is outside of Beaujolais, yet technically part of the Loire. He and his wife, Gwen, are lovely people, and we could not be more thrilled to have our guests to meet them and taste the fruits of their labor. 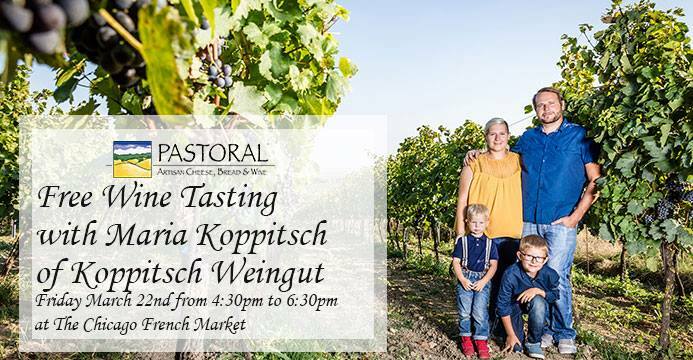 Join us Friday March 22nd from 4:30 to 6:30pm in the French Market for a free wine tasting with Maria Koppitsch of Koppitsch Weingut. Maria and her husband, Alexander, took over his family's Austrian estate in 2011 and began making wine. Using Biodynamic practices, hand harvesting with minimal additions of sulfur and light filtering, Koppitsch wines are hands-off and terroir driven as the vineyards are situated on the shores of Neusidl Lake and feature soft, rolling hills of mostly limestone soil. 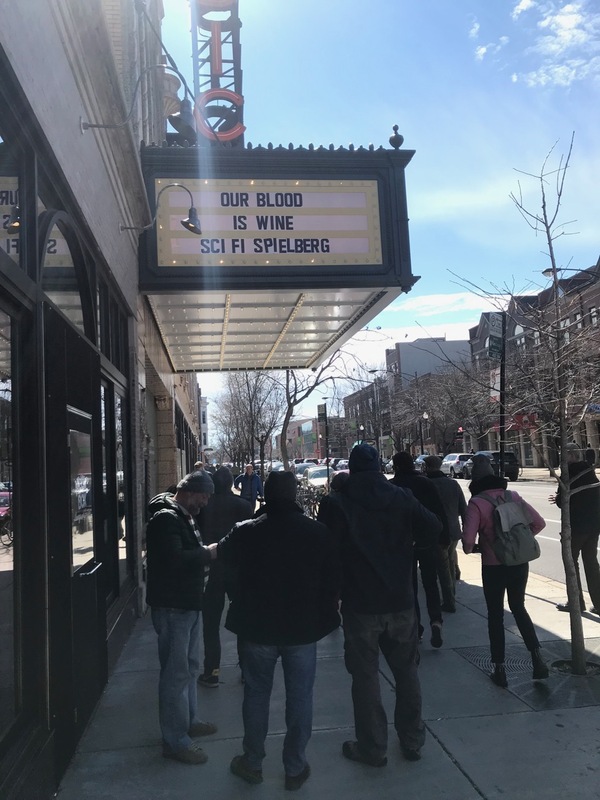 Maria is in town for Third Coast Soif so if you missed out on buying a ticket to Chicago's 3rd natural wine fair or would like to get a sneak peek, stop by and say hello. Cheers! No tasting today, but a special by the glass take over in the bar, in celebration of Martha Stoumen's and Evan Lewandowski's birthdays. Should be tons of fun. 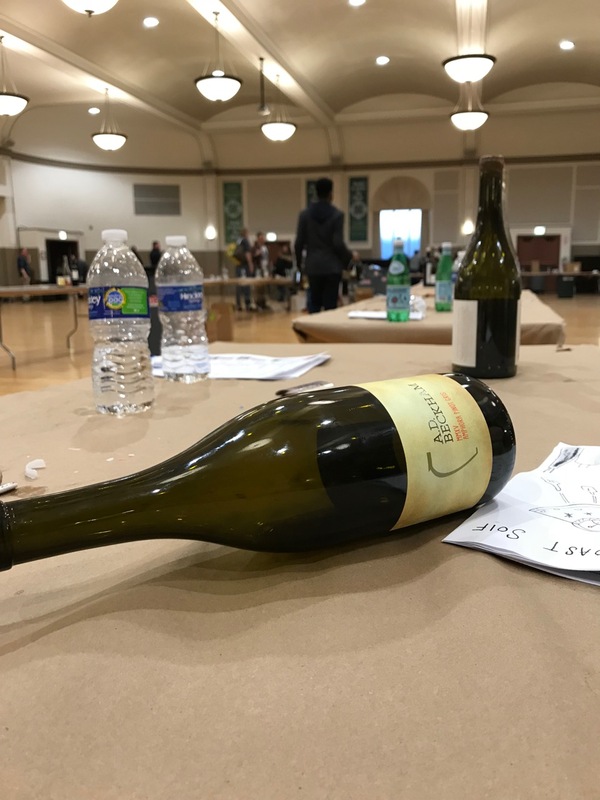 Warm up for Third Coast Soif with us and some stellar Spanish wine folks: importer Alvaro de la Vina of Selections de la Vina and winemaker Francesc Escala of Can Sumoi. Ticket includes a glass of txakoli, a plate of Spanish-inspired snacks, and front-row seats at the porron relay*. We’ll have an extra-special array of glass pours from our Spanish friends and more fun foods at the ready. Porrons, pintxos, and pals await. Won’t you join us? *…or the opportunity to participate it if your porron skills are up for it. 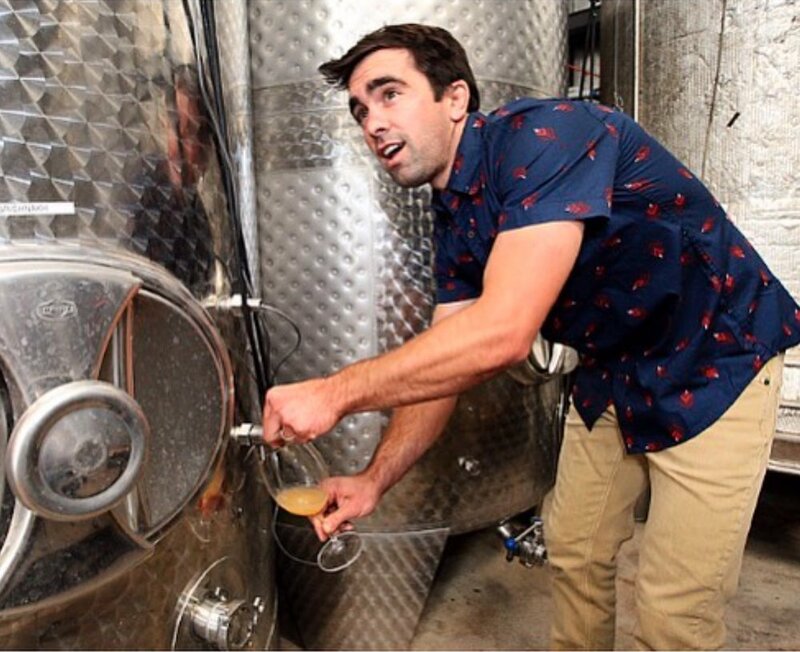 Join us for a special 4-course wine dinner Friday March 22nd at 6pm, featuring natural wines by Les Vins Pirouettes, a project that helps organic and biodynamic grape growers in Alsace move away from selling their grapes to cooperatives and towards making and bottling natural wines themselves. Vanessa Letort, one of the founders of Les Vins Pirouettes will be on hand to guide guests through the wines. Limited to 30 seats this special event features a menu by executive chef Bobby Schaffer and Chef de Cuisine Colin McGill. Tickets are available at lostlarson.com for $75 per guest (inclusive of dinner, wine, tax and gratuity). Menu details and tickets available by clicking through the bottle photo. Webster's Wine Bar is welcoming winemaker Joel Burt to Chicago the only way we know how, with a late night wine hooley! 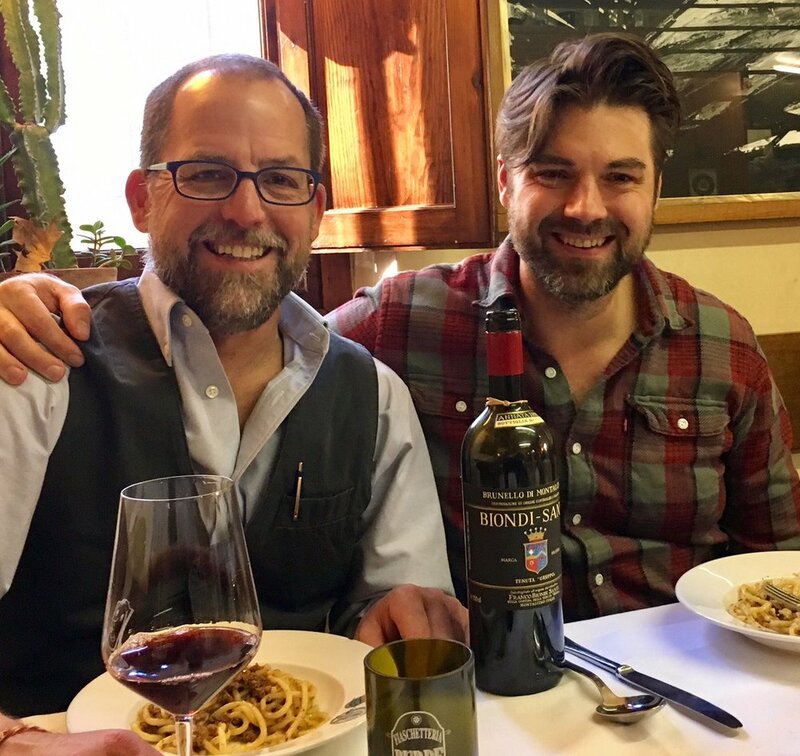 Joel Burt and Eric Wareheim, started making wine that reflect unique terroir with minimal intervention, to create wines with an expression to be reveled in. The best part? Each selection is a mere $14 per glass!! 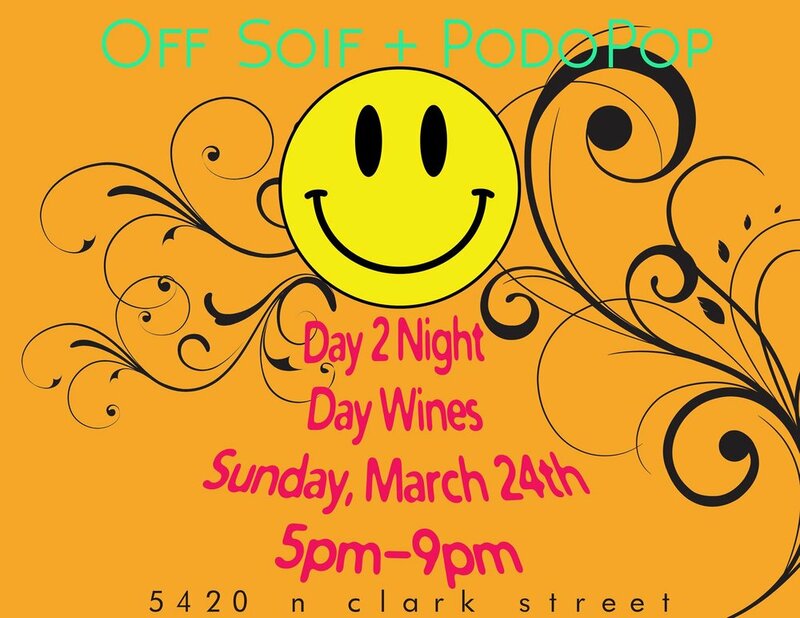 Passerotto's Sundays Only Pop-up Wine Bar! Sundays Only Kitchen Menu! Off-menu korean comfort food made to pair with the wine we pour. Morgan will be pouring her wines and visiting your table, starting right after Soif! Don't miss this opportunity to taste some incredible wine, and meet one of the most passionate winemaker in Oregon. Come soif up some Absentee Winery, Martha Stoumen wines, Smockshop Band and Ruth Lewandowski wines after your full day at the wine fair. Pete and company will also have a special Middlebrow Beer / Ruth Lewandowski beer-wine blend on draft for your thirsty face. 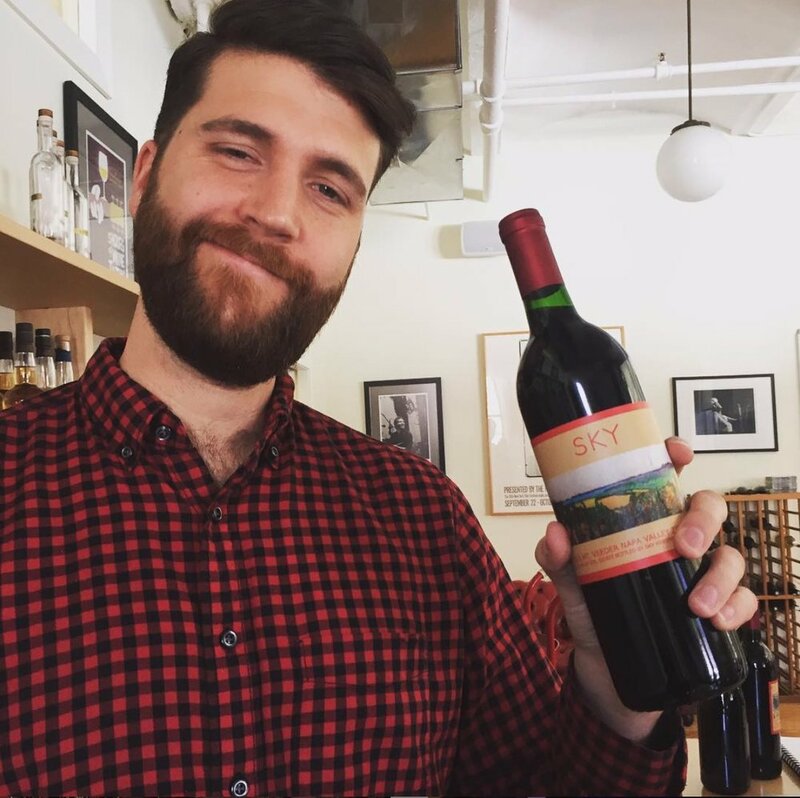 Tasting featuring Gideon Bienstock of Clos Saron and Nate Ready of Hiyu Farm & Smockshop Band. @ Table, Donkey & Stick Tuesday March 26 8:30pm til ? Below is a short list of places in Chicago which champion naturally produced, minimal intervention wines.